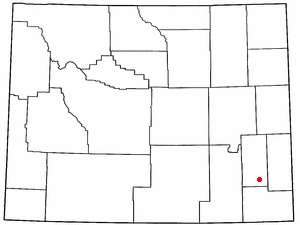 Chugwater is a town in Platte County, Wyoming, in the United States. As of the 2000 census, the town population was 244. In a 2005 promotion to attract new people to the town, building lots were offered for $100 provided the new owner built a house within a year and lived in it for at least 2 years. The former Speaker of the Wyoming House of Representatives, Harold Hellbaum (19262007) farmed and ranched in Chugwater. He served in the state legislature from 19631977, his last term as Speaker. Some historians hold that the name "Chugwater" is derived from a Mandan account of a bison hunt. According to this narrative, a chief was disabled during the hunt and his son took charge of the hunt or "Buffalo jump". Here's the our members favorite photos of "Cities in Platte County". Upload your photo of Chugwater!